(Nanowerk News) Few physical systems are better understood than the interference of two planar waves—like ripples on a pond. Proving that there are still secrets to be discovered even in such fundamentally well-known systems, RIKEN researchers Konstantin Bliokh, Aleksandr Bekshaev and Franco Nori have used theory to reveal a new, hidden force in this system that acts on particles in an unexpected way ("Transverse Spin and Momentum in Two-Wave Interference"). Recent research has showed that interfering planar waves can have unusual properties on a small scale. For over a century, waves such as light beams have been known to carry both momentum and angular momentum in the direction of the propagating wave and this momentum can be used to move and rotate small particles. This is consistent with the common understanding of photons as particles carrying momentum and spin. On the local scale in non-plane-wave optical fields, however, light can also impart forces and torques perpendicular to the light beam, counterintuitive to our everyday experience. These unusual effects have been noticed in highly confined near-field radiation known as evanescent waves, but so far they have not turned up in freely propagating light waves. In a comprehensive theoretical study, the scientists, from the RIKEN Center for Emergent Matter Science and Interdisciplinary Theoretical Science Research Group (iTHES), revisited the concept of two propagating waves interfering in the same plane. 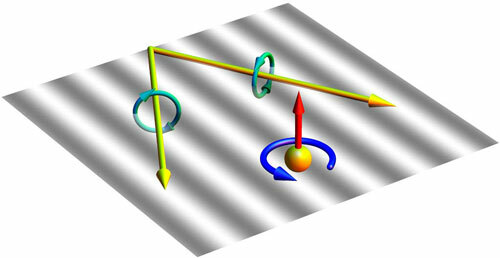 Their mathematical analysis of this system revealed that even this well-studied example of interfering waves can exert a force and torque on a small particle perpendicular to both waves (Fig. 1). Both the force and torque are strongly dependent on the polarization of the two interfering waves, which differs to the conventional experience of waves carrying the same momentum irrespective of their polarizations.